Emma Mullins, a music teacher at Lakeside Academy, received an “I Am Hamilton” T-shirt for her passion for music and her ability to pass that along to the children in her class. The district presents the special shirts to individuals for efforts that positively impact Hamilton County Schools and the children it serves. “She is funny, kind and always available to help people,” said Jamarcus Varnell, a student at Lakeside Academy. “In class, we are writing our own songs, and I have learned that a song needs a theme, hook, chorus and bridge.” Jarmacus shared that he was writing a love song. 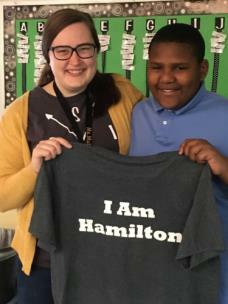 “I am Hamilton” spotlights the contributions of alumni, teachers, parents, students, support workers, and community members providing opportunities for children in the classrooms of Hamilton County Schools.